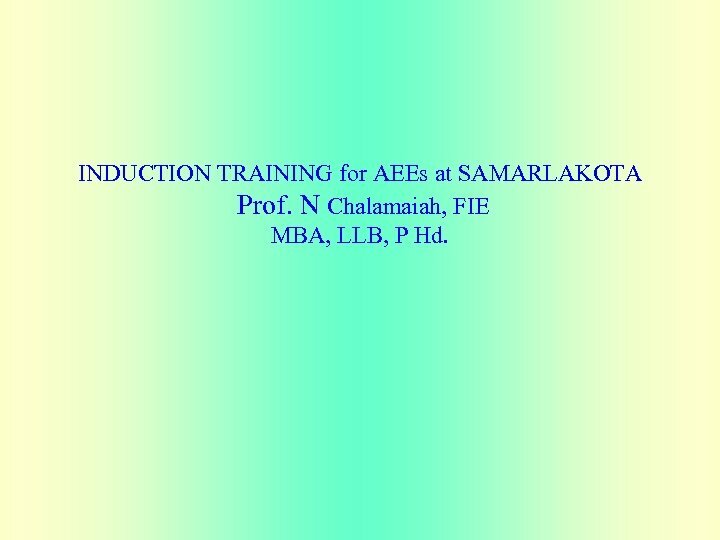 INDUCTION TRAINING for AEEs at SAMARLAKOTA Prof. N Chalamaiah, FIE MBA, LLB, P Hd. 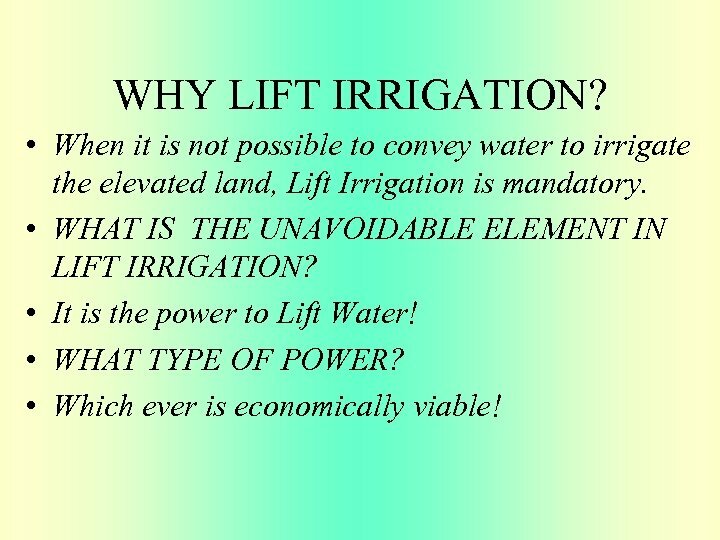 WHY LIFT IRRIGATION? 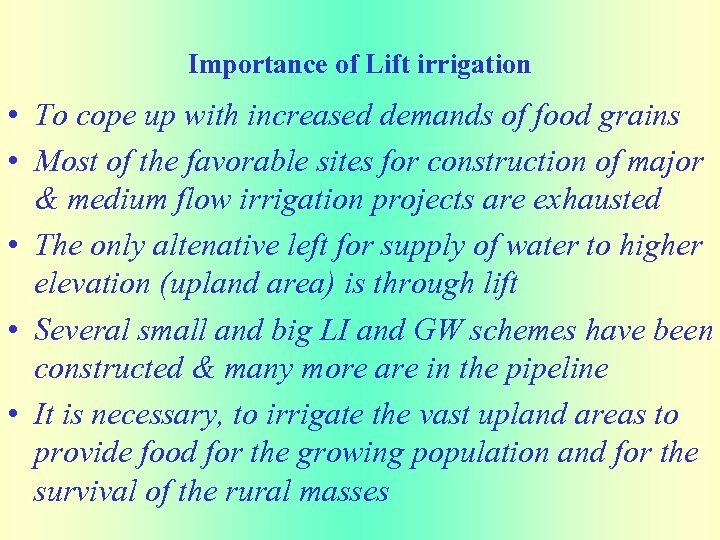 • When it is not possible to convey water to irrigate the elevated land, Lift Irrigation is mandatory. 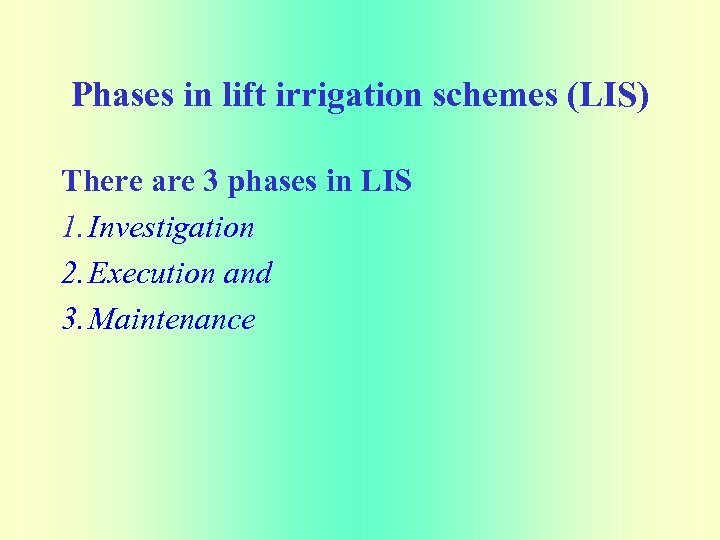 • WHAT IS THE UNAVOIDABLE ELEMENT IN LIFT IRRIGATION? • It is the power to Lift Water! • WHAT TYPE OF POWER? • Which ever is economically viable! 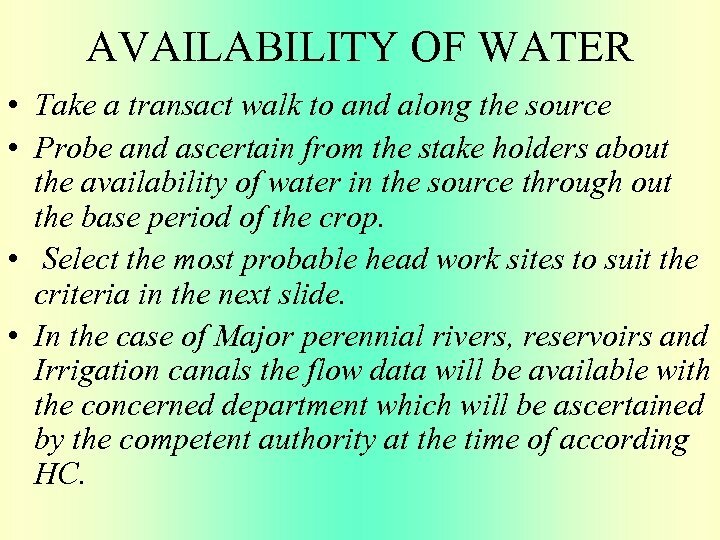 AVAILABILITY OF WATER • Take a transact walk to and along the source • Probe and ascertain from the stake holders about the availability of water in the source through out the base period of the crop. 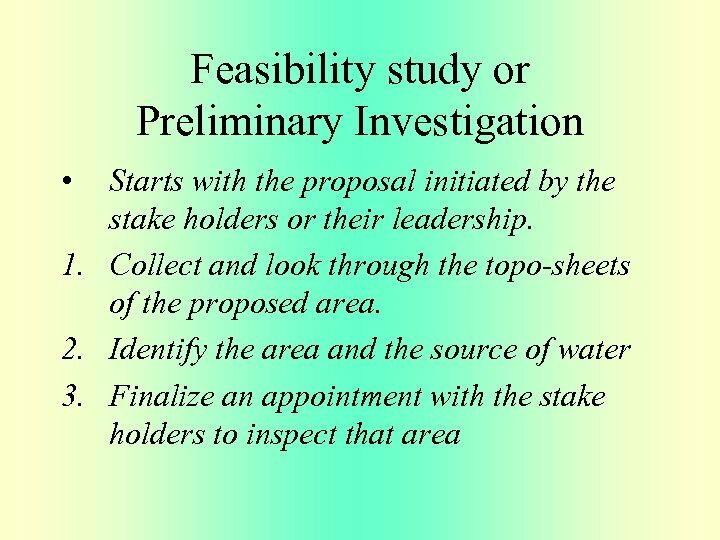 • Select the most probable head work sites to suit the criteria in the next slide. 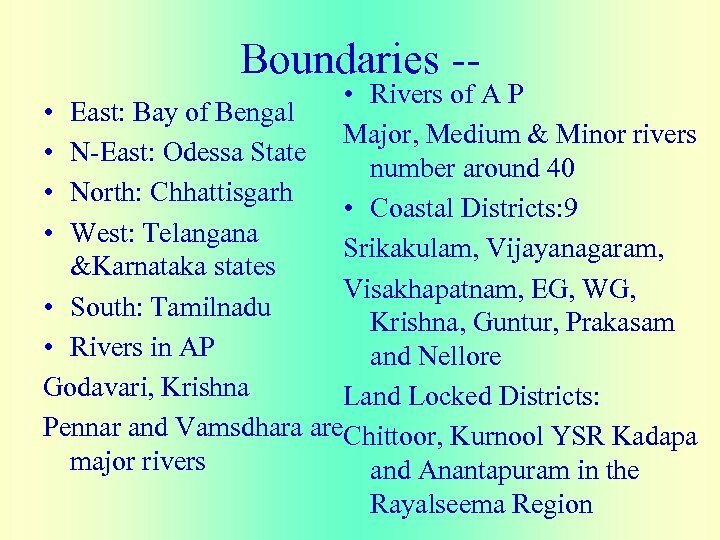 • In the case of Major perennial rivers, reservoirs and Irrigation canals the flow data will be available with the concerned department which will be ascertained by the competent authority at the time of according HC. Conti. 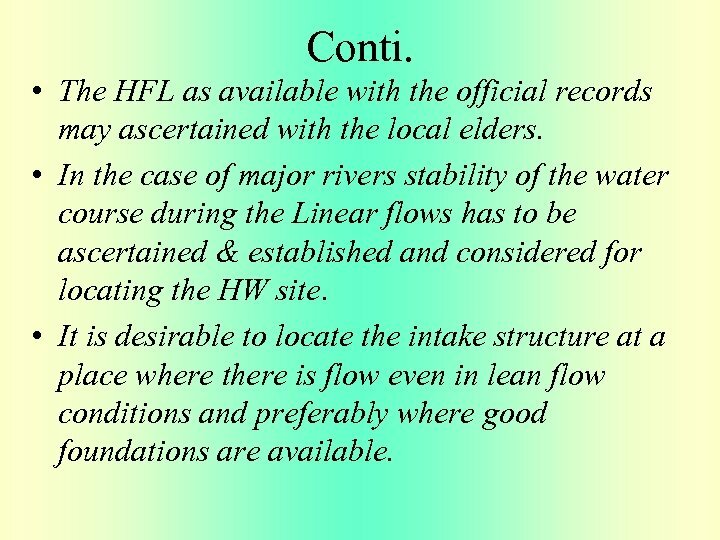 • The HFL as available with the official records may ascertained with the local elders. 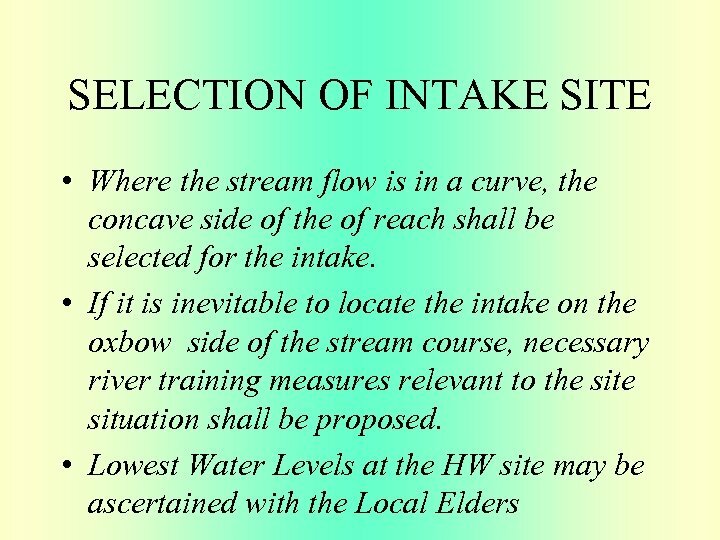 • In the case of major rivers stability of the water course during the Linear flows has to be ascertained & established and considered for locating the HW site. 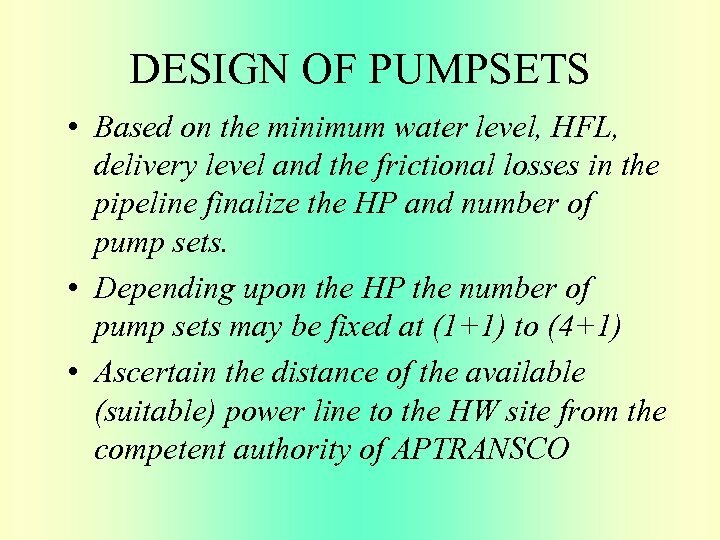 • It is desirable to locate the intake structure at a place where there is flow even in lean flow conditions and preferably where good foundations are available. 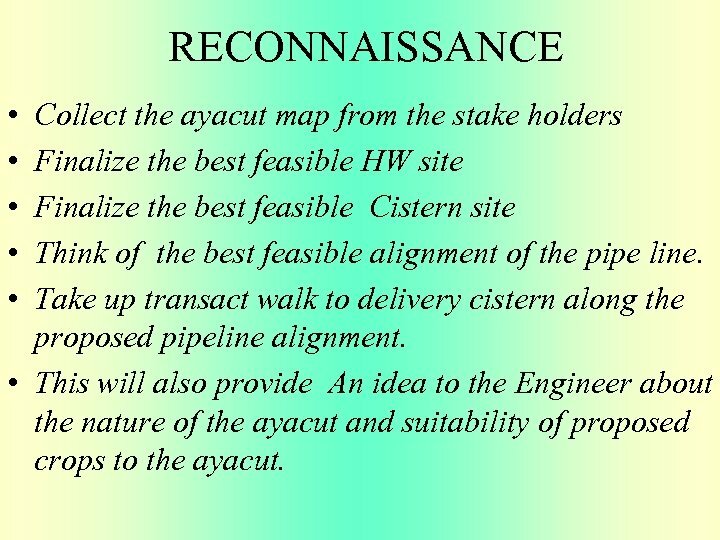 RECONNAISSANCE • • • Collect the ayacut map from the stake holders Finalize the best feasible HW site Finalize the best feasible Cistern site Think of the best feasible alignment of the pipe line. Take up transact walk to delivery cistern along the proposed pipeline alignment. 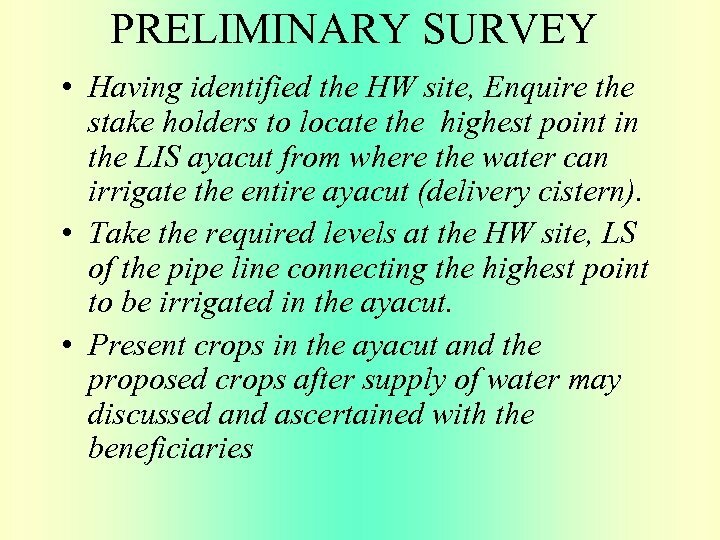 • This will also provide An idea to the Engineer about the nature of the ayacut and suitability of proposed crops to the ayacut. 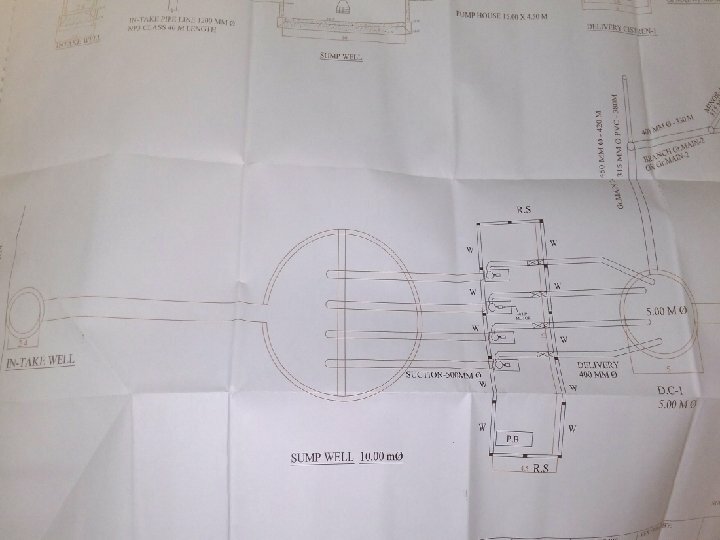 DESIGN OF THE PIPE LINE • Fix the Delivery level of the Pipe in the Cistern • Fix the diameter of the pressure main for the required discharge. 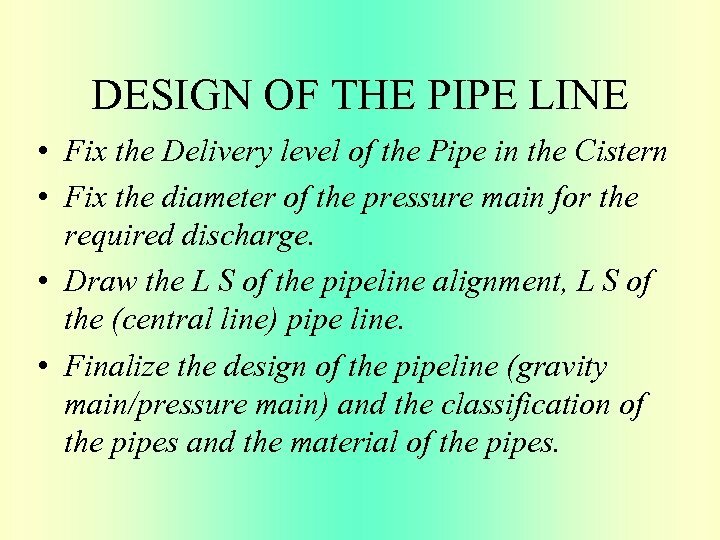 • Draw the L S of the pipeline alignment, L S of the (central line) pipe line. 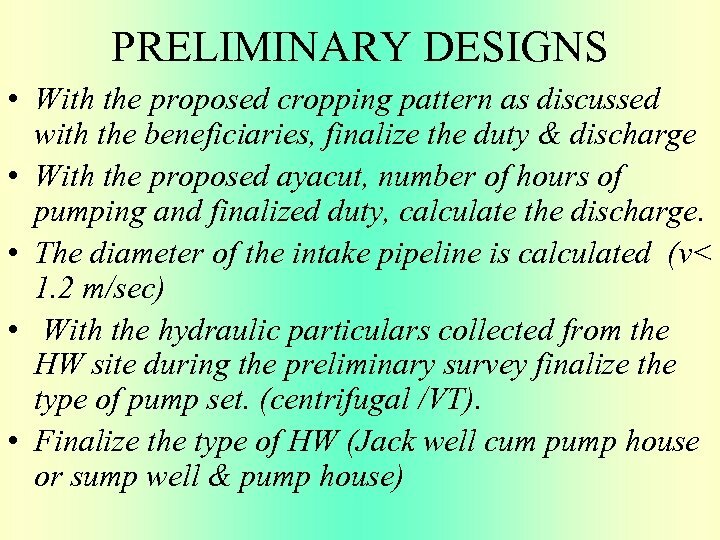 • Finalize the design of the pipeline (gravity main/pressure main) and the classification of the pipes and the material of the pipes. 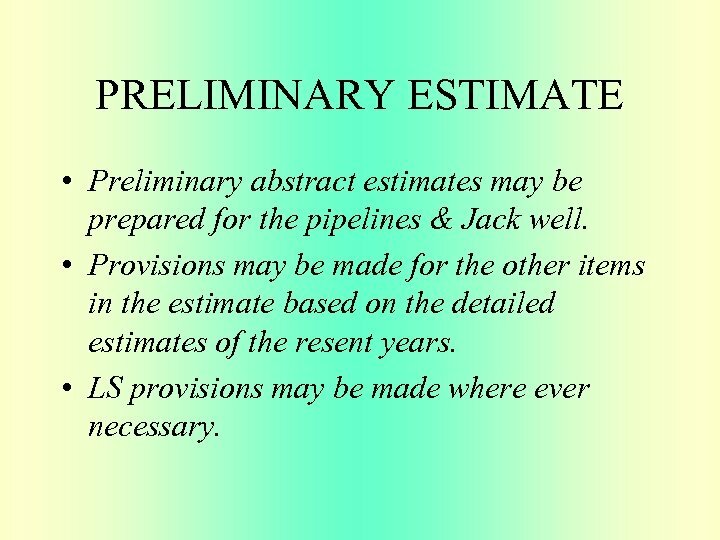 PRELIMINARY ESTIMATE • Preliminary abstract estimates may be prepared for the pipelines & Jack well. • Provisions may be made for the other items in the estimate based on the detailed estimates of the resent years. 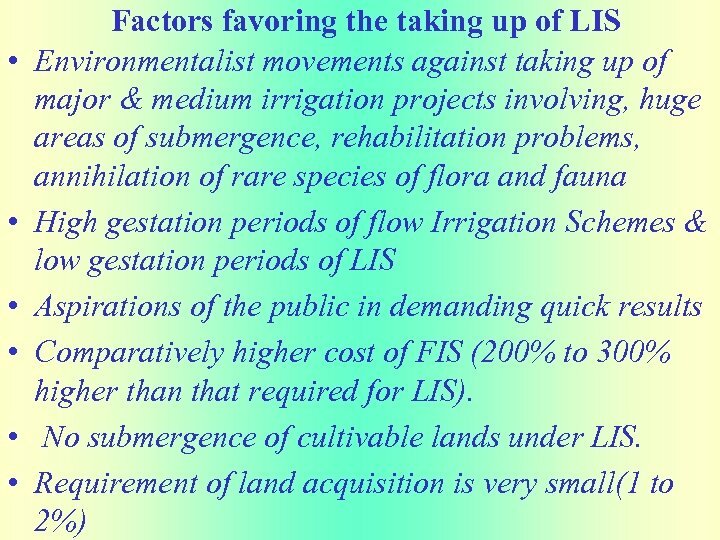 • LS provisions may be made where ever necessary. 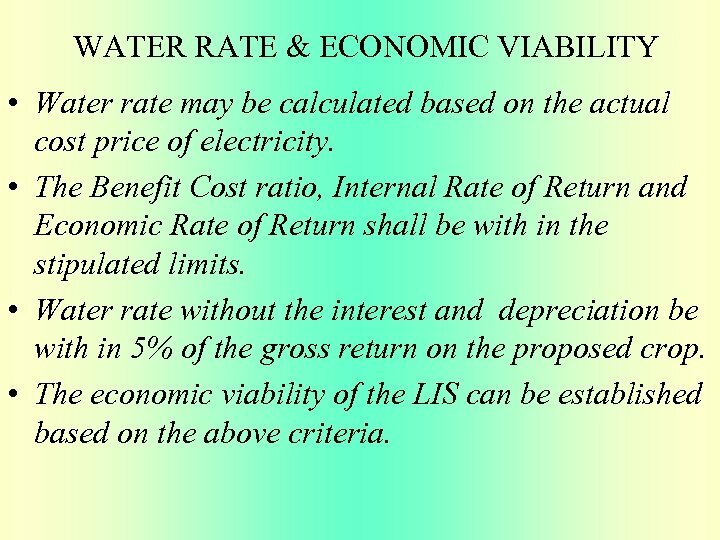 WATER RATE & ECONOMIC VIABILITY • Water rate may be calculated based on the actual cost price of electricity. • The Benefit Cost ratio, Internal Rate of Return and Economic Rate of Return shall be with in the stipulated limits. 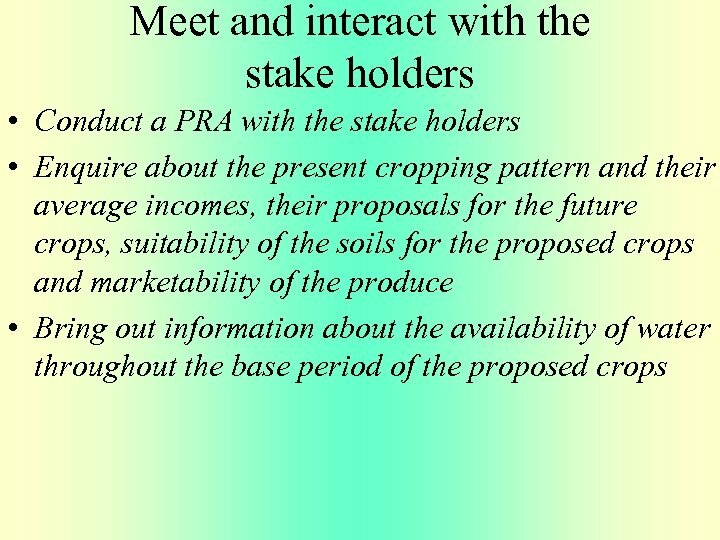 • Water rate without the interest and depreciation be with in 5% of the gross return on the proposed crop. 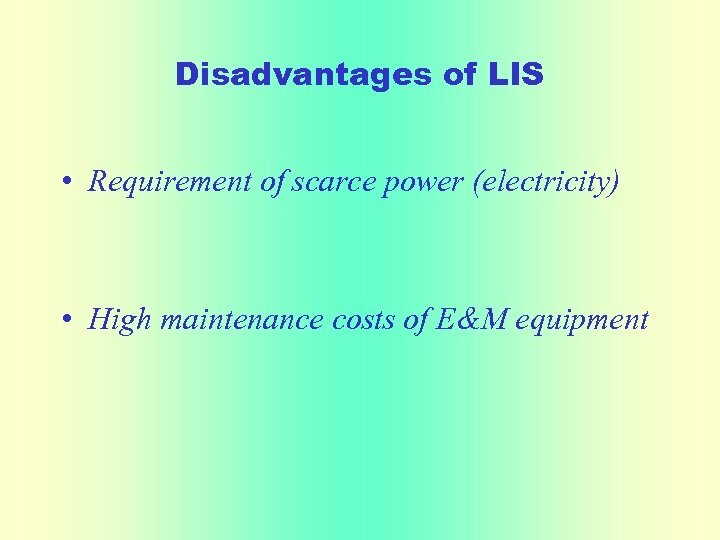 • The economic viability of the LIS can be established based on the above criteria. 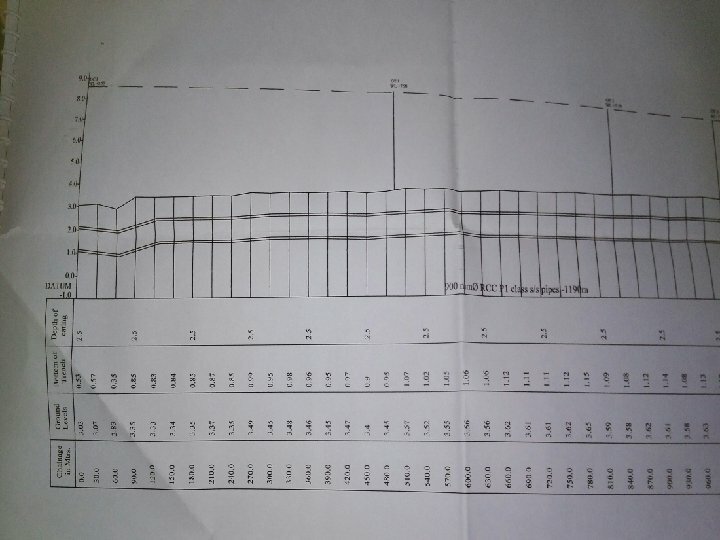 DPR • First take up contour Survey • On the contour map propose the HW Site, Delivery point, Intake point, Gravity mains and Pressure mains, Open min channels and other distributaries system along with CM & CD works. 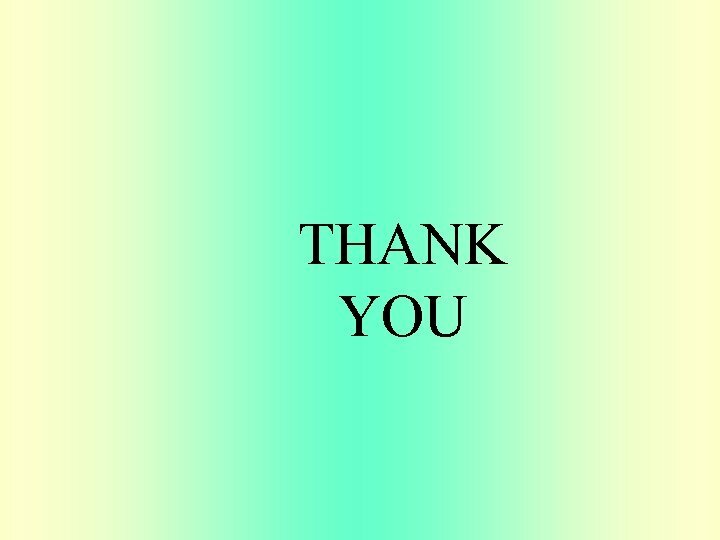 • Take up the detailed survey of all the above proposals. 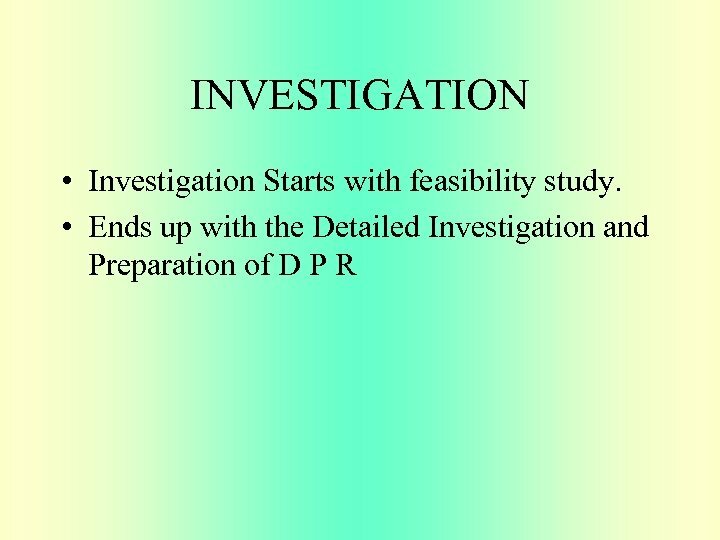 • Prepare the DPR as per present standards and requirements. 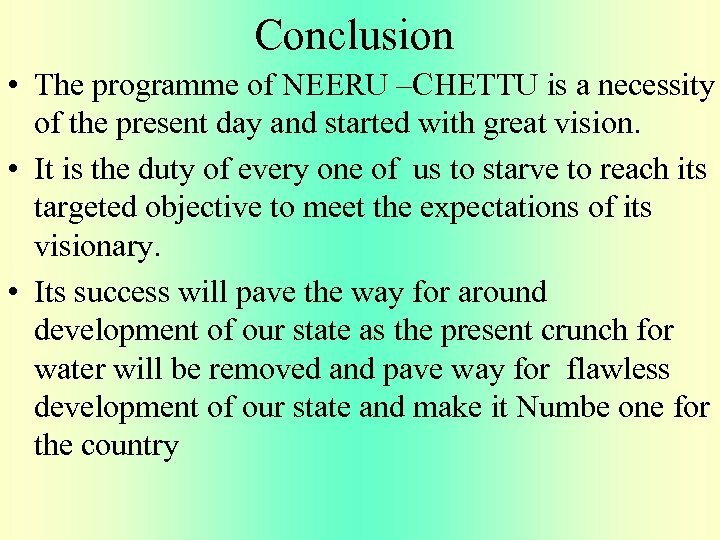 NEERU - CHETTU The Vision of the Hon'ble Chief Minister of Andhra Pradesh is to prepare the state as 'drought proof' state within 5 years and is aimed to eradicate of poverty and reducing economic inequalities by better Water Conservation. 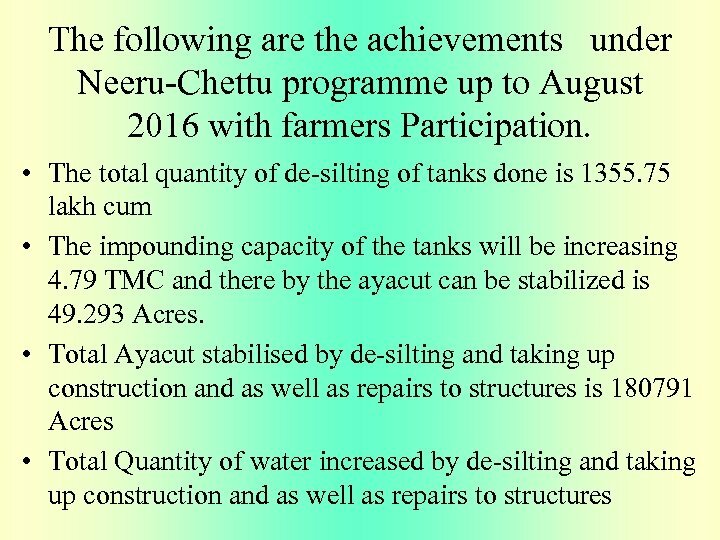 The Government of Andhra Pradesh has taken up Water Conservation Mission Neeru Chettu Sub. 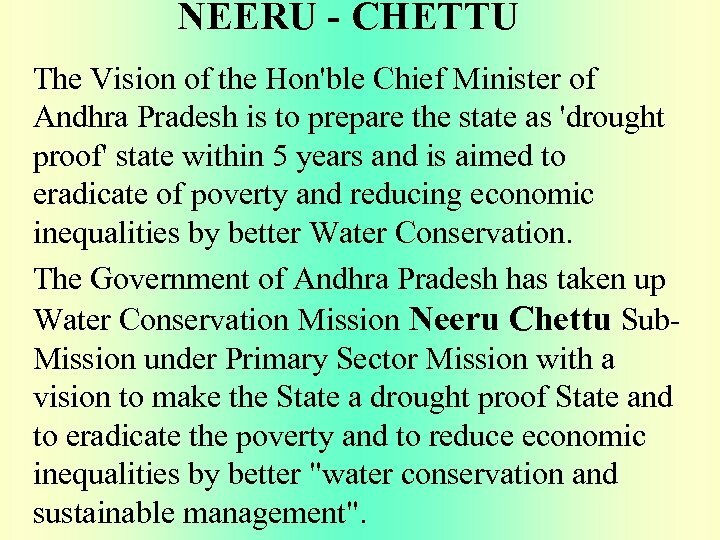 Mission under Primary Sector Mission with a vision to make the State a drought proof State and to eradicate the poverty and to reduce economic inequalities by better "water conservation and sustainable management". Conti. 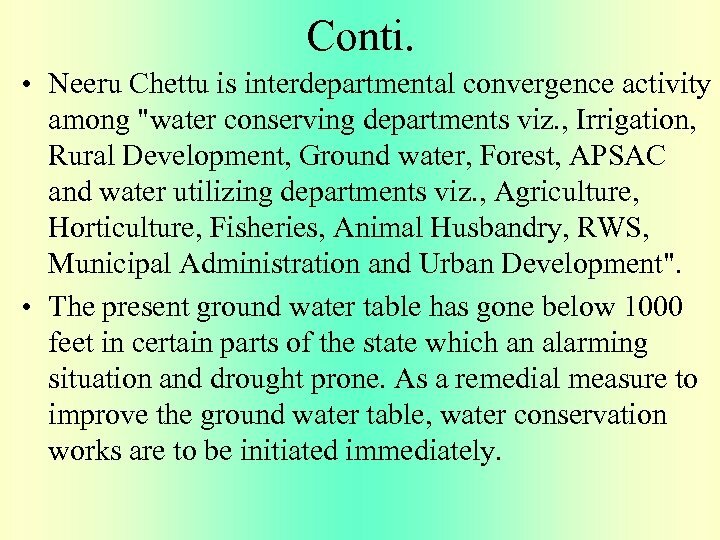 • Neeru Chettu is interdepartmental convergence activity among "water conserving departments viz. 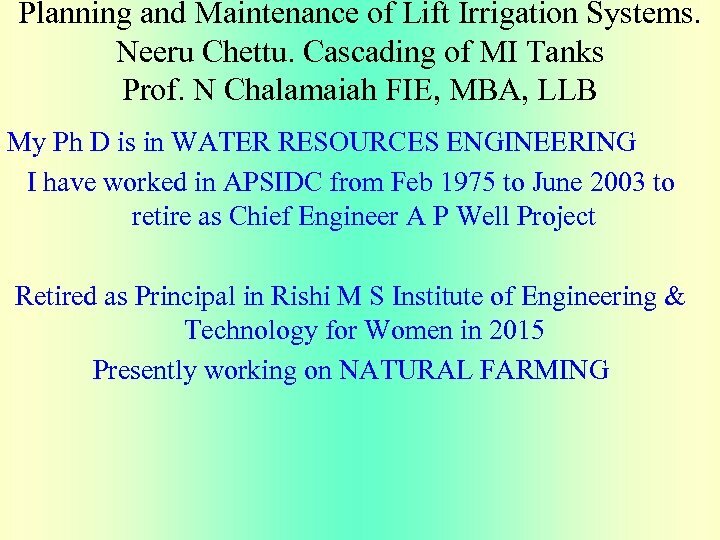 , Irrigation, Rural Development, Ground water, Forest, APSAC and water utilizing departments viz. 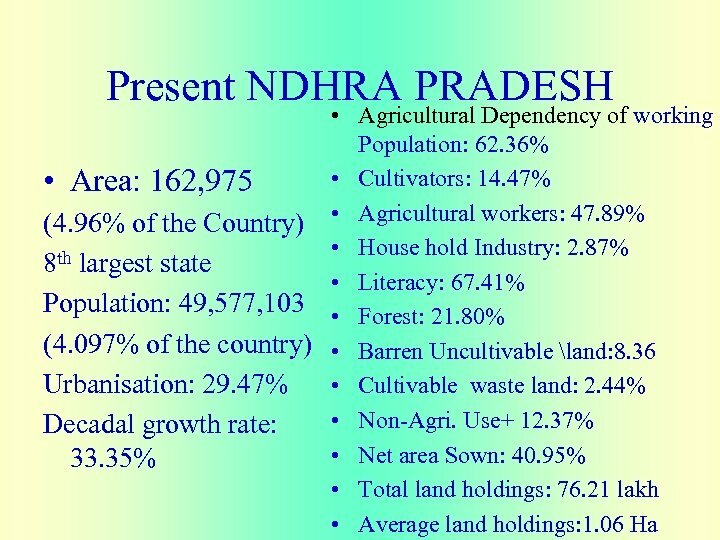 , Agriculture, Horticulture, Fisheries, Animal Husbandry, RWS, Municipal Administration and Urban Development". 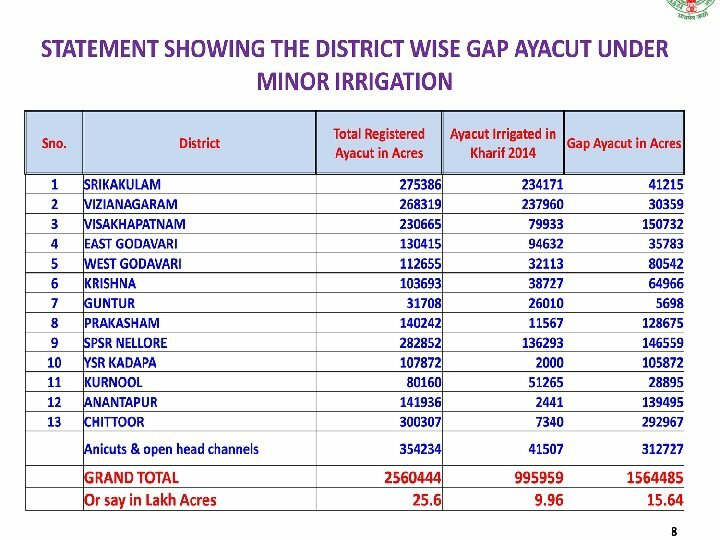 • The present ground water table has gone below 1000 feet in certain parts of the state which an alarming situation and drought prone. 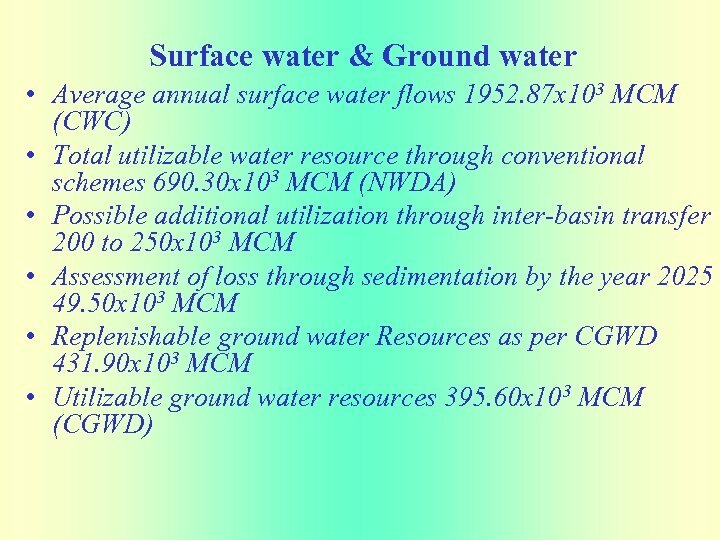 As a remedial measure to improve the ground water table, water conservation works are to be initiated immediately. 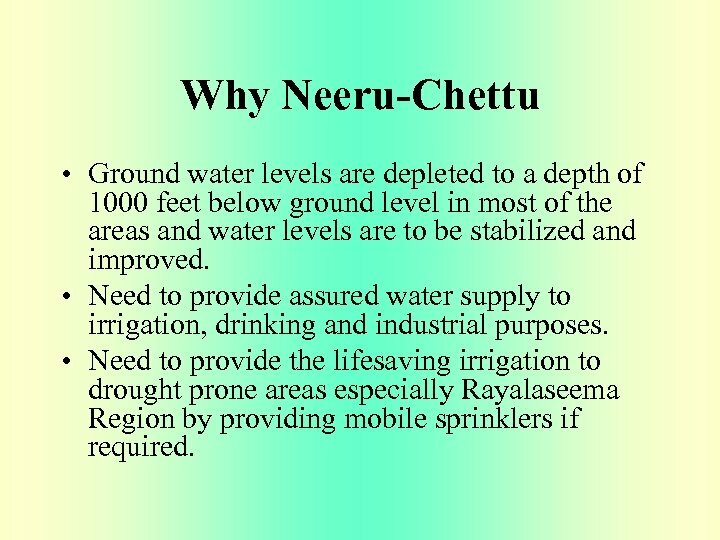 Why Neeru-Chettu • Ground water levels are depleted to a depth of 1000 feet below ground level in most of the areas and water levels are to be stabilized and improved. 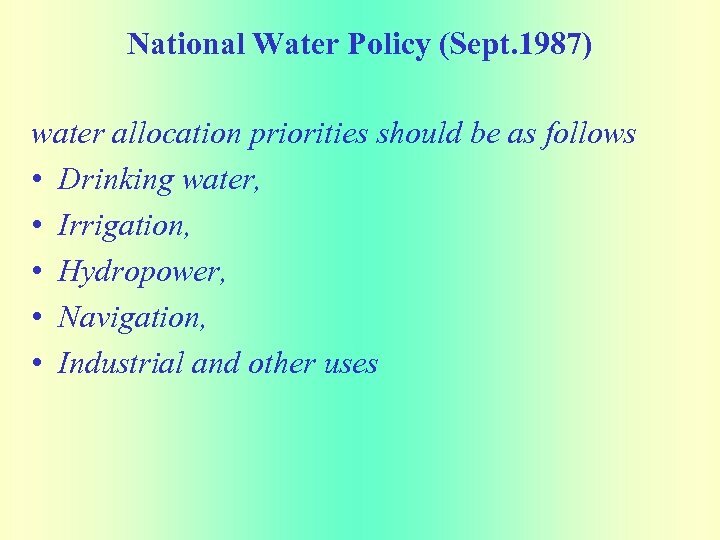 • Need to provide assured water supply to irrigation, drinking and industrial purposes. 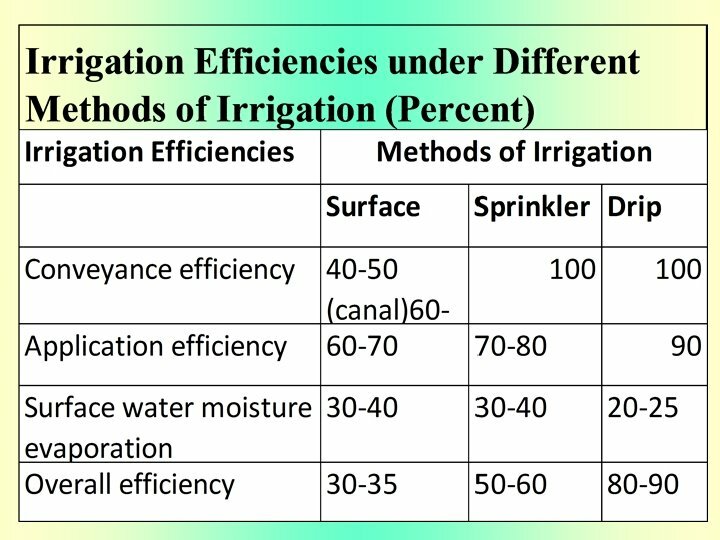 • Need to provide the lifesaving irrigation to drought prone areas especially Rayalaseema Region by providing mobile sprinklers if required. Strategy • Repairs and renovation of existing water harvesting structures and construction of new structures such as check dams, percolation tanks, MI tanks, sub-surface dams and farm ponds thereby increasing the ground water recharge. • Arresting the soil erosion by following the ridge to valley approach. 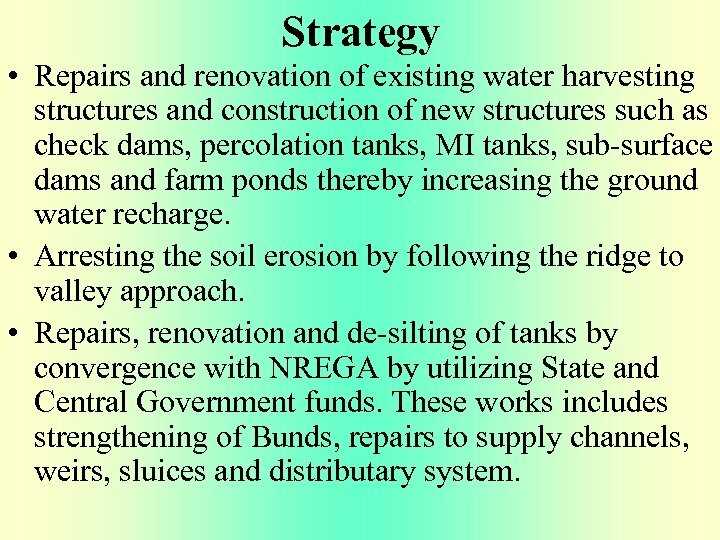 • Repairs, renovation and de-silting of tanks by convergence with NREGA by utilizing State and Central Government funds. 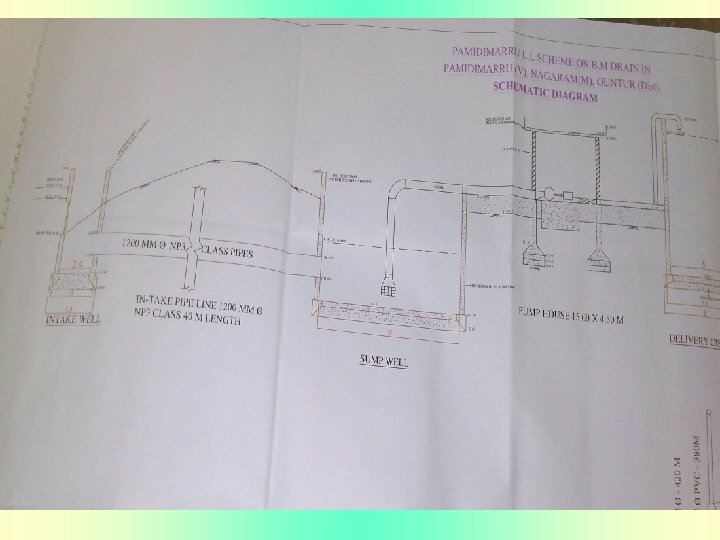 These works includes strengthening of Bunds, repairs to supply channels, weirs, sluices and distributary system. Conti. • Repairs and restoration of defunct LI schemes and construction of new LI schemes. 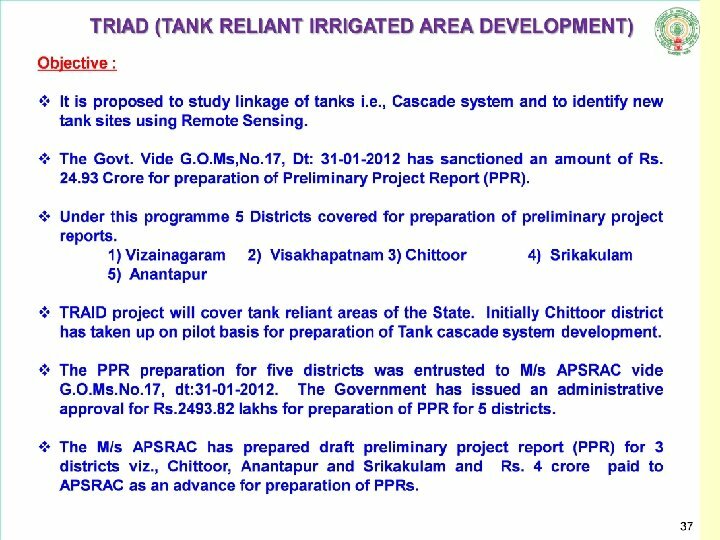 • Development of cascades i. e. chain of tanks to divert water from surplus basin to deficit basin using latest GIS and satellite technology. 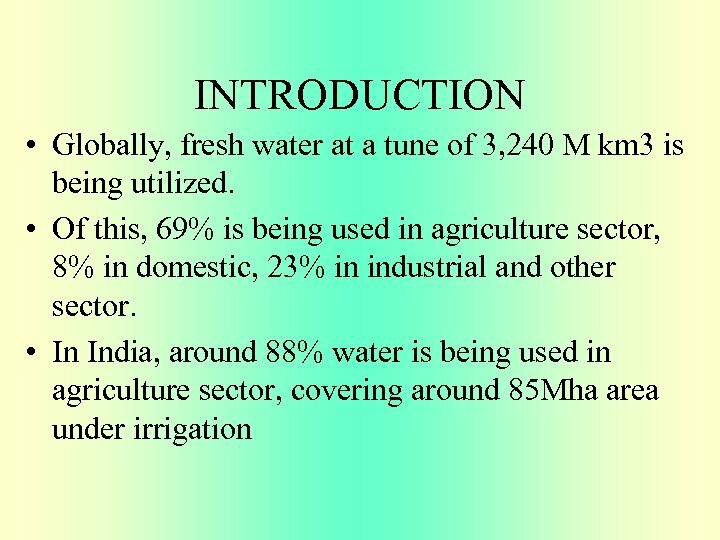 • Encouraging micro irrigation on large scale and mobile micro irrigation practices in severe water scarce areas. • To take up 7 No. 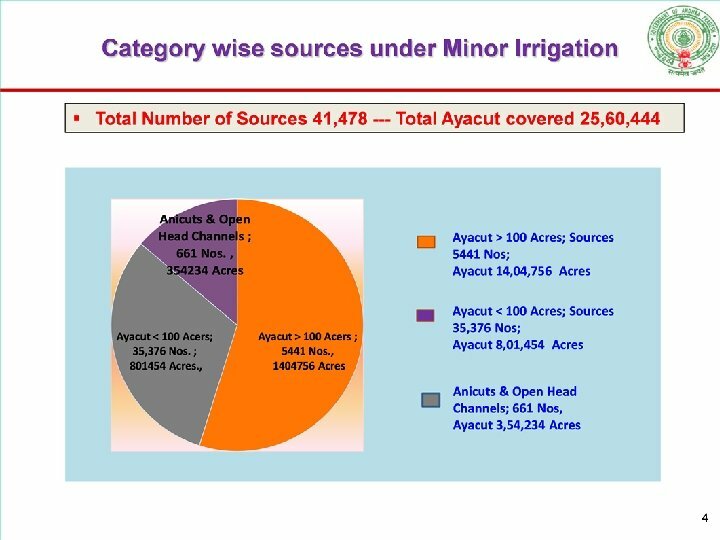 s of prioritized projects pertaining to Major and Medium Irrigation. 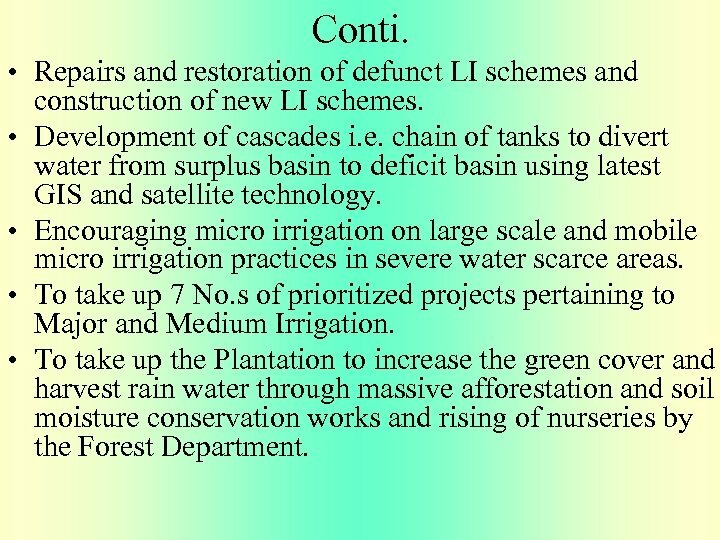 • To take up the Plantation to increase the green cover and harvest rain water through massive afforestation and soil moisture conservation works and rising of nurseries by the Forest Department. 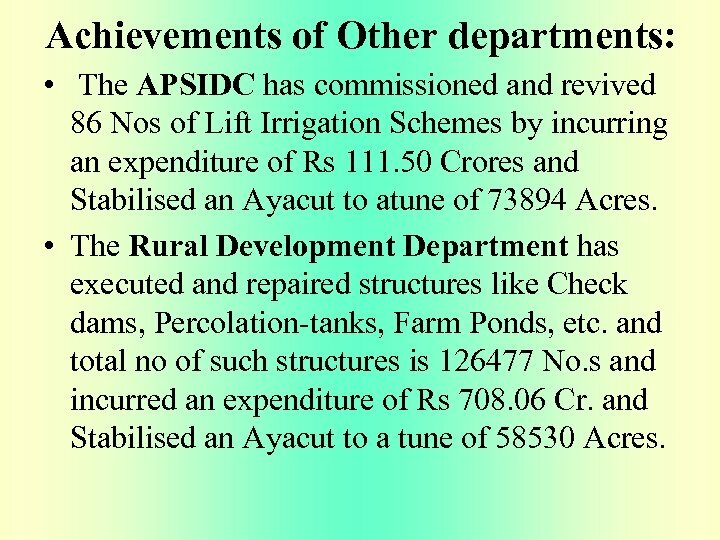 Achievements of Other departments: • The APSIDC has commissioned and revived 86 Nos of Lift Irrigation Schemes by incurring an expenditure of Rs 111. 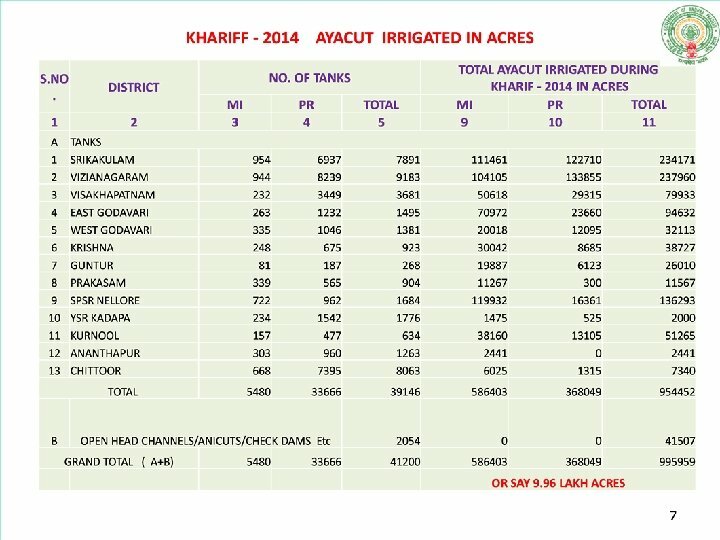 50 Crores and Stabilised an Ayacut to atune of 73894 Acres. • The Rural Development Department has executed and repaired structures like Check dams, Percolation-tanks, Farm Ponds, etc. and total no of such structures is 126477 No. s and incurred an expenditure of Rs 708. 06 Cr. 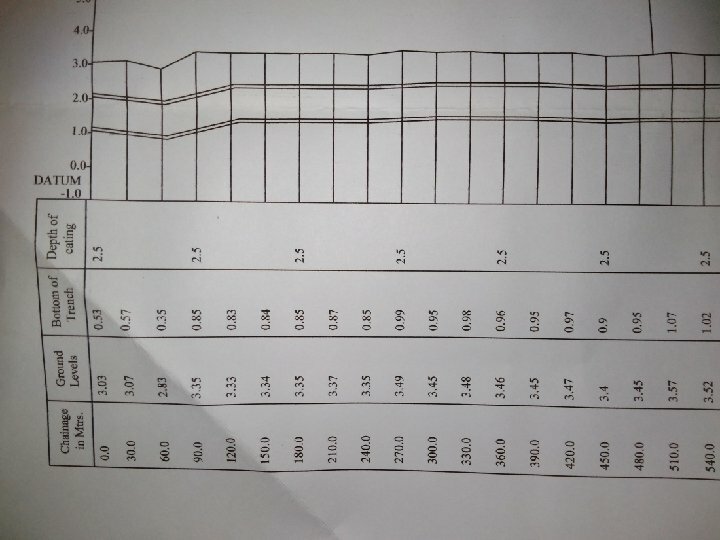 and Stabilised an Ayacut to a tune of 58530 Acres. Forest Department • A. 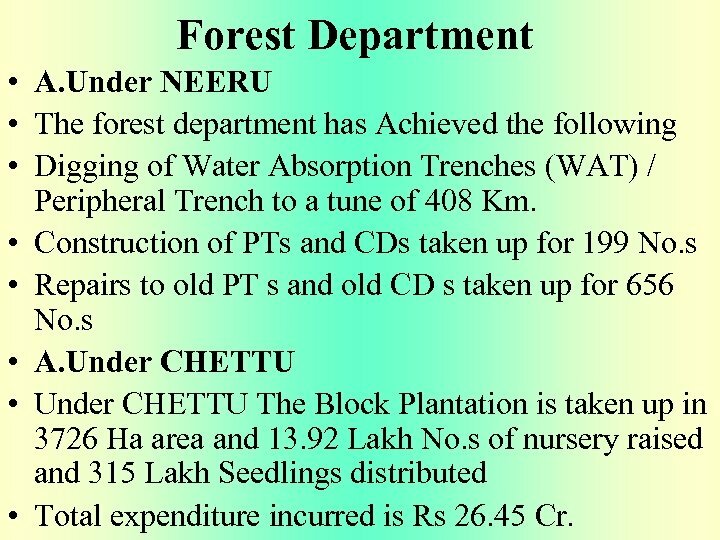 Under NEERU • The forest department has Achieved the following • Digging of Water Absorption Trenches (WAT) / Peripheral Trench to a tune of 408 Km. • Construction of PTs and CDs taken up for 199 No. s • Repairs to old PT s and old CD s taken up for 656 No. s • A. 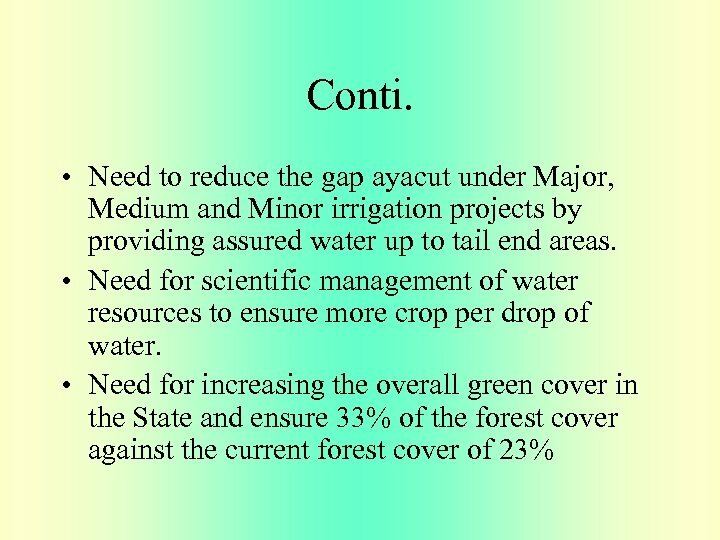 Under CHETTU • Under CHETTU The Block Plantation is taken up in 3726 Ha area and 13. 92 Lakh No. s of nursery raised and 315 Lakh Seedlings distributed • Total expenditure incurred is Rs 26. 45 Cr. CASCADING of IRRIGATION WATER TANKS The cascade system of tanks is a unique and traditional mechanism, believed to have originated over 2, 500 years ago, and is used to capture and utilise rainwater. This means that water is available during the dry season, helps avoid floods and supports everyday living. 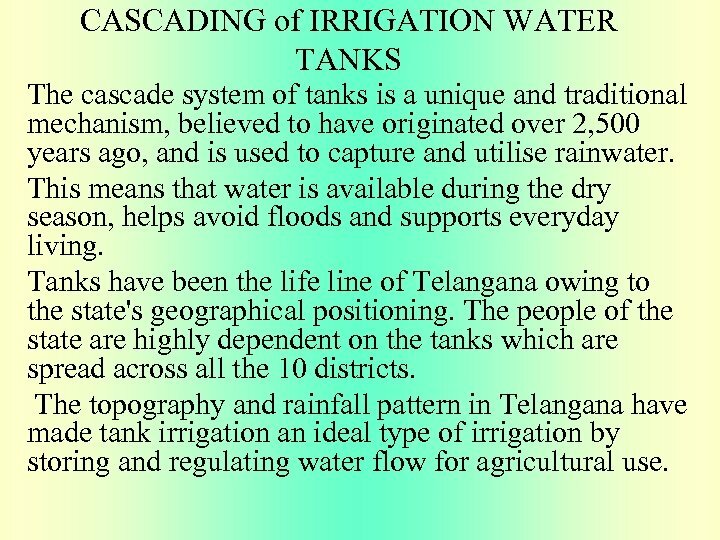 Tanks have been the life line of Telangana owing to the state's geographical positioning. The people of the state are highly dependent on the tanks which are spread across all the 10 districts. 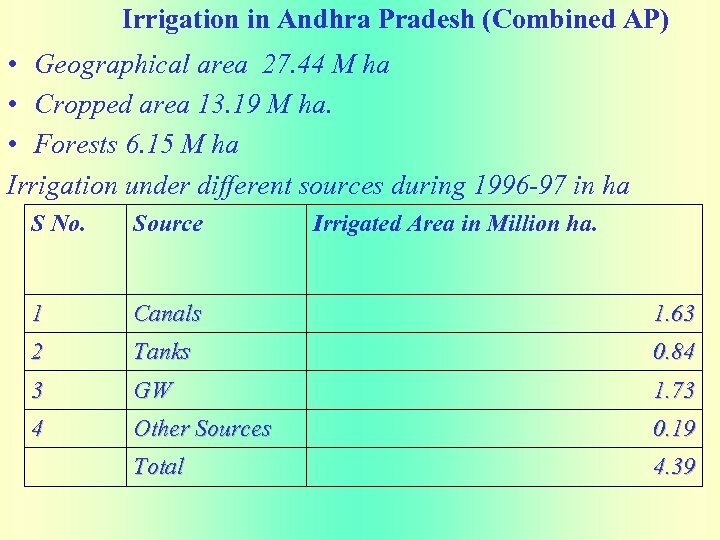 The topography and rainfall pattern in Telangana have made tank irrigation an ideal type of irrigation by storing and regulating water flow for agricultural use. 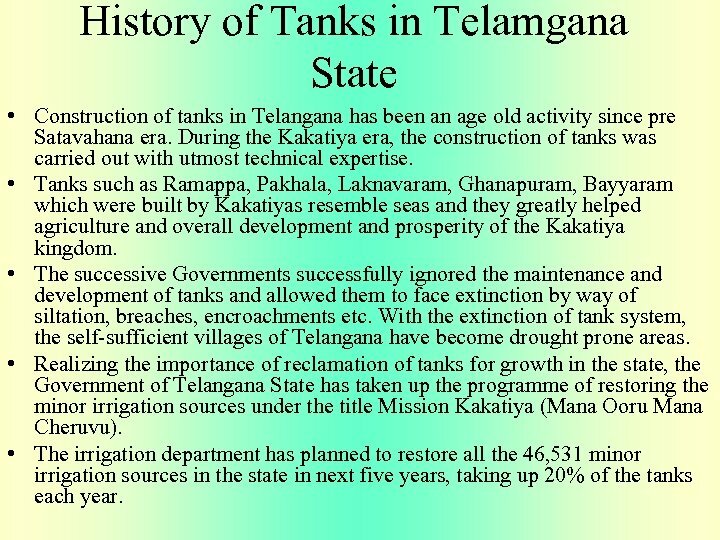 History of Tanks in Telamgana State • Construction of tanks in Telangana has been an age old activity since pre Satavahana era. During the Kakatiya era, the construction of tanks was carried out with utmost technical expertise. • Tanks such as Ramappa, Pakhala, Laknavaram, Ghanapuram, Bayyaram which were built by Kakatiyas resemble seas and they greatly helped agriculture and overall development and prosperity of the Kakatiya kingdom. 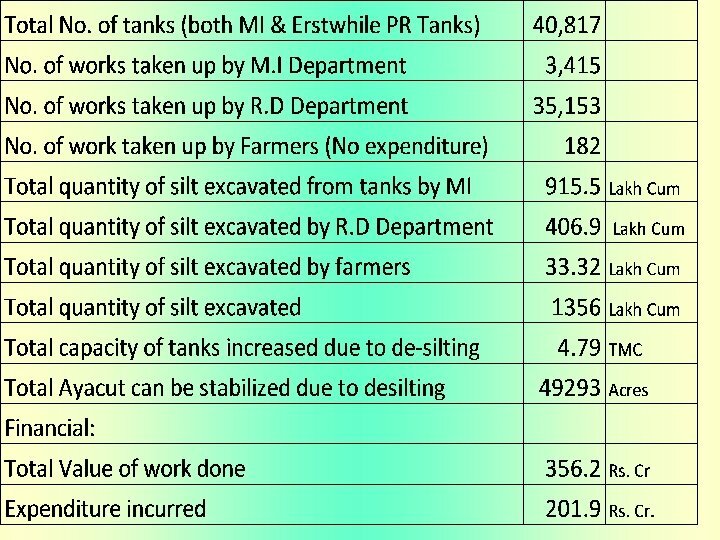 • The successive Governments successfully ignored the maintenance and development of tanks and allowed them to face extinction by way of siltation, breaches, encroachments etc. 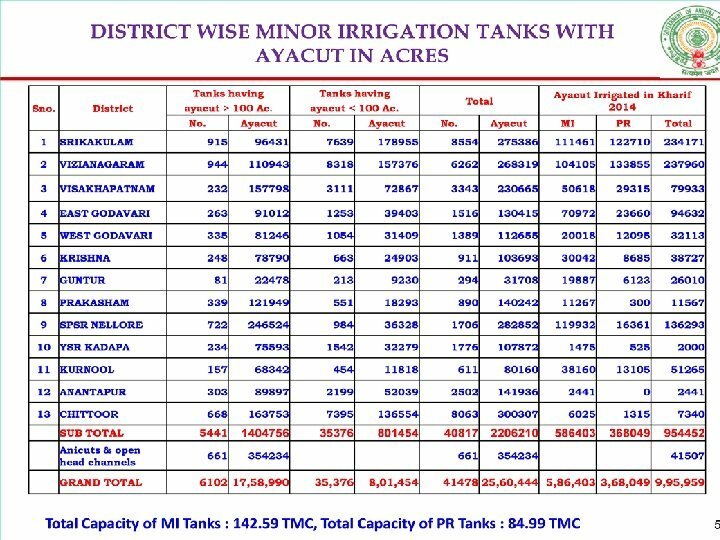 With the extinction of tank system, the self-sufficient villages of Telangana have become drought prone areas. 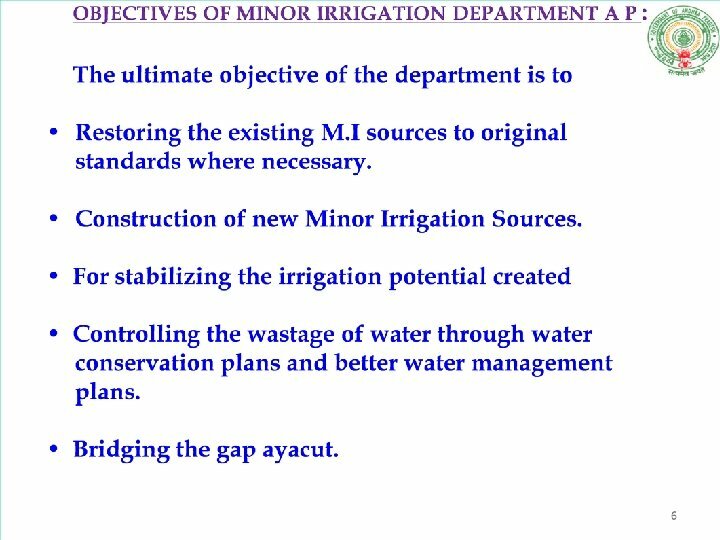 • Realizing the importance of reclamation of tanks for growth in the state, the Government of Telangana State has taken up the programme of restoring the minor irrigation sources under the title Mission Kakatiya (Mana Ooru Mana Cheruvu). 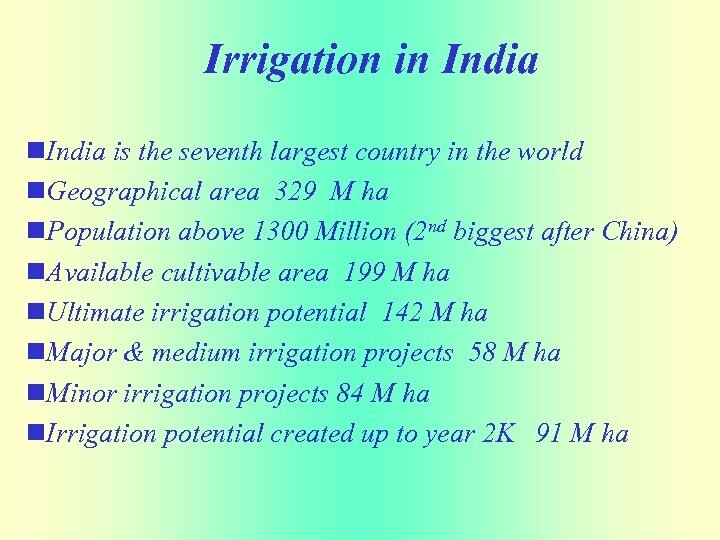 • The irrigation department has planned to restore all the 46, 531 minor irrigation sources in the state in next five years, taking up 20% of the tanks each year. 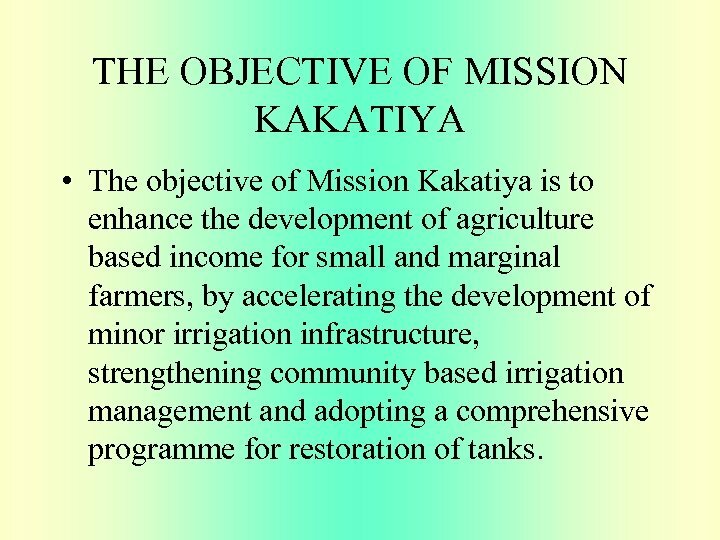 THE OBJECTIVE OF MISSION KAKATIYA • The objective of Mission Kakatiya is to enhance the development of agriculture based income for small and marginal farmers, by accelerating the development of minor irrigation infrastructure, strengthening community based irrigation management and adopting a comprehensive programme for restoration of tanks.